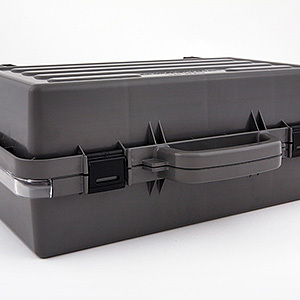 Plastic storage cases have a wide array of benefits, including a variety of uses for all your business and hobby needs. However, it really does not matter how you use your plastic storage cases. When it comes to finding the ideal cases; ample space, a secure lock and extended capacity are highly important. Plastic storage cases allow you to organize your items efficiently. And when your items are structured and arranged, it leaves room for more storage and space. And with the cases being compact and organized, they become easy to carry. This is highly important when traveling, especially when you have limited room and space. For example, you may have a small booth at a nearby show where you sell your gems and semi-precious rocks. However, you want to bring as many types of gems possible to put on display. I this case, it is imperative that you have plenty of space so that you can set up a nice showcase for all potential buyers. Moreover, when there is ample space; items are much easier to find when you need them. In fact, being organized makes it much easier to find items and pack (or unpack) them safely. There is nothing more frustrating than to have a case that does not stay closed. Invariably, the moment you lift the case, everything falls out. Of course this always happens when you are in a hurry and you need to be somewhere important. On the other hand, a high quality plastic storage case has a lid that securely locks and keeps your items safe. For instance, there are certain cases like the Exactapak and Multi 10 that are specifically designed to remain locked without any overflow. Plastic storage cases that have the capacity to meet all your needs are irreplaceable. For instance, it is important to have a case that is large enough to hold your items but is not massive. When it is too small, you will be forever stuffing things in which is a potential for damaged object. If your case is too big, it becomes cumbersome even when traveling. As well, items seem to flop around easier and become mixed up with other objects and sometimes broken. However, the ideal case is compact but has a large capacity to hold many items. Such as, a well-designed compact case will have removable insert tubs, internal lids for preventing chaos and a professional systematized charm.